The weird vessel that caused a security scare in New York on Friday was a homemade replica of a Revolutionary War submarine. Police held the artist, Philip "Duke" Riley, and two other Rhode Island men, Jesse Bushnell, 35, and Michael Cushing, 23, for questioning. 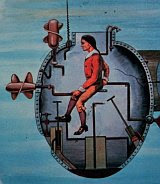 But there was no indication the trio meant any harm with the replica of the 1776 "Turtle submarine."